Salt Spring U14 Strikers get ready for a semi-final cup match against Sooke on Saturday, Jan. 19 at Portlock Park at 12:30 p.m. From left in the back row, Cheryl Roehlig (manager), Miranda Bantel, India Hayden, Nina DeRoo, Patricia Griffiths, Yuli Roehlig, Maggie Nephtali, McKenna Jason, Asia Stevenson, Mia Kerrigan, Emilie Bevan and Chris Jason (coach). In front, from left, Sonya Reynolds and Olive Goddard. Missing is Quinn Nickels. 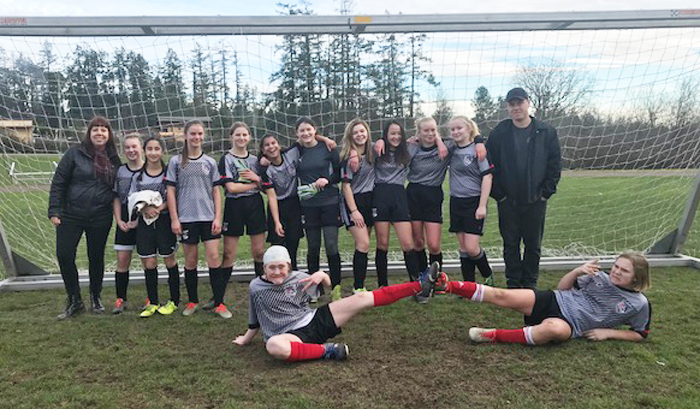 Salt Spring United’s U14 girls soccer team will play in a semi-final game in front of a home crowd this Saturday, Jan. 19. The Salt Spring Strikers will host a Sooke team — one of its biggest rivals — at Portlock Park beginning at 12:30 p.m. The Strikers currently sit in second place in league standings and would qualify for the finals in February with a win on Saturday. Islanders are encouraged to come out and cheer the girls on to victory. The Strikers are coached by Chris Jason.